The Win a Million Dollars slots game by Playtech is a video slots game with a "riches" theme. The slot features 5 reels, 4 paylines and 34 winning combinations in addition to bonuses. The symbols include a variety of luxury items such as a diamonds, coins, cash, safes, briefcases and dollar signs, all of which represent the riches you could win. The graphics of the game feature rich purples and golds, representing wealth. It also has a modern interface that gives you the feeling as though you are sitting at a Vegas slot machine, only from your own home. The game also features symbols of The Wild Millionaire, Happy Millionaire and the Million Scatter, all of which can lead to you winning a bundle. 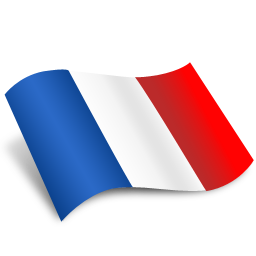 Players have several options available in terms of betting. Coin sizes include quarters, fifty cents, dollars, two dollars and five dollars. The maximum coins that can be bet at once is five coins or $25. The Win a Million Dollars slot machine features two jackpot options including 200,000 coins and 15,000 coins. Win a Million Dollars slot features autoplay, so that you can set your pace and play as laid back as you want. Simply enter your standing wager and initiate play. This prevents you from having to continuously hit the "spin" button as you play. When you decide to increase or change your wager, you can simply stop the autoplay and change your wager. This feature is available to you as many times as necessary throughout the gaming experience. You can even set a time delay between spins if you want to. 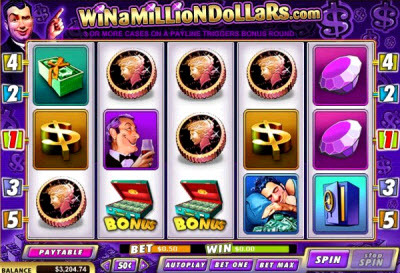 Win a Million Dollars features a second screen bonus game that provides you with the ability to increase your wealth quickly. The bonus is activated by three briefcase symbols. The bonus round is a "Pick a Box" style bonus game that allows you to pick one or more items to reveal your bonus amount until the bonus round is completed. The best thing about playing the online slot machine Win A Million Dollars is that you can actually win a million in one spin. However, you will have to be playing the max bet and hit the 5 million symbols in order to win it. However, you can win lavishly while you're playing, no matter what you wager. On Win A Million Dollars slots you can win from the left or the right, but you can only win once on each separate line. You cannot win twice on the same line. You will be paid the higher win on amount on one line if there is more than one win on the line. While playing, you also have the option of deactivating play lines. If you click on a payline indicator, all of the paylines up to and including the line will be turned on. All other lines will be turned off. If you click on the third line, then the first, second and third paylines will become activated and the fourth and fifth lines are turned off. If you click on the fifth payline, then all lines will be turned on. You cannot turn off and on specific paylines.